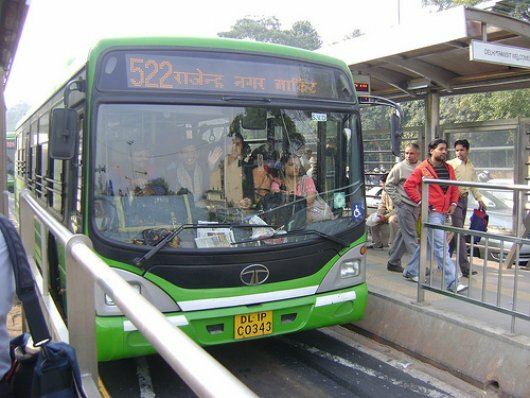 Can Indian cities move past the negative perception of BRT created during the opening of Delhi's system? Bangalore is leading the charge. Photo by the Centre for Sustainable Transport in India. Last Friday, sustainable transport advocates came a step closer to gaining widespread support for Bus Rapid Transit (BRT) in India when Bangalore officials announced that the government will move ahead with the implementation of the city’s proposed BRT system. Dr. A. Ravindra, the Urban Affairs Advisor to the Chief Minister, asked local transport and development agencies to push forward with the project. BRT has the potential to address the crippling congestion and deteriorating air quality faced by Indian cities. A cost-effective approach to providing high-quality, fast and clean transportation, BRT has been successful in other cities facing similar challenges, such as Istanbul. Despite its applicability in India, BRT’s road to acceptance hasn’t been smooth, and progress has been uneven across cities. The Jawaharlal Nehru National Urban Renewal Mission has funded projects in Ahmedabad, Indore, Jaipur and Pune, which are now in the implementation phase. But the problems experienced during the opening of Delhi’s system in 2008 dealt a major blow to BRT support all over the country. In its first few weeks, the BRT suffered traffic signal malfunctions, bus breakdowns, ill-equipped drivers, and the invasion of the bus lanes by other vehicles. The issues were covered widely by the media, which focused on the inconveniences caused to drivers. Most of the problems are being corrected, but many Indian officials remain soured on BRT. Bangalore’s commitment to BRT will be instrumental in combating that attitude. The city will begin work on a 30-kilometer pilot project on the Outer Ring Road from Hebbal to Central Silk Board junction. Eventually, the proposed system will have 14 corridors totaling 290 kilometers and will cost Rs 3,498 crore (approximately $760 million). Perhaps this progress can motivate officials in Mumbai, who have been studying BRT for more than six years. The Mumbai Metropolitan Regional Development Authority has completed preliminary analysis for 50 kilometers of BRT on two expressways, but has now decided to hand the project over to the Brihanmumbai Municipal Corporation and BEST, the city’s bus operator. The next steps are unclear, as the BMC and BEST may not have the technical expertise, the manpower or the funding to undertake implementation. Critics also point to the lack of political will that is paralyzing the project. BRT is seen as a feeder system to other transport modes in Mumbai, which relegates it to the back burner. The MMRDA is more focused on higher-profile (and sometimes less cost-effective) projects such as the monorail, metro rail and sea links. Moreover, policy makers have not been sufficiently educated about the benefits of BRT. Transport experts are calling for Mumbai’s BRT projects to move to the implementation stage. Mumbai could introduce BRT in some of its more congested corridors, dedicating central lanes to high capacity buses in a model similar to Istanbul’s.